Looking for a great family vacation? Want to reconnect with the family, while disconnecting the digital age? Then get off the power grid. Unplug yourself from all those digital necessities of our modern world ’cause they won’t work here. So where exactly are you going? 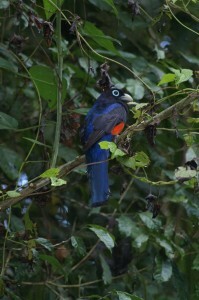 Definitely off the beaten path and into one of the least visited regions of Costa Rica. Almost to Panama, in fact. 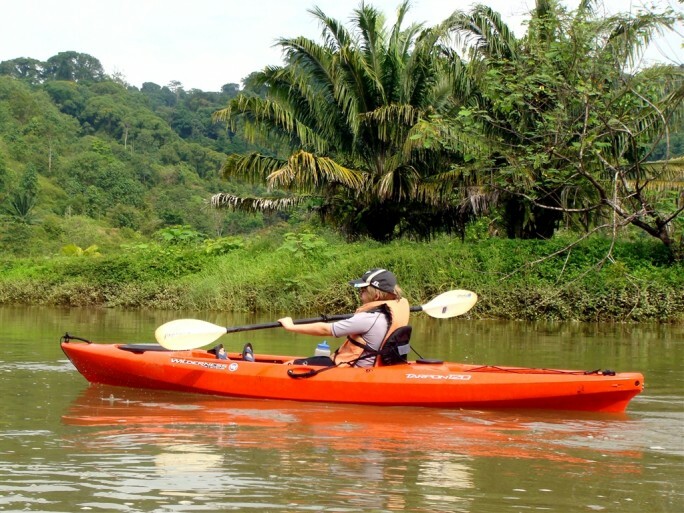 Our destination: The Osa Peninsula’s Golfo Dulce and the Playa Nicuesa Rainforest Lodge. What’s that? 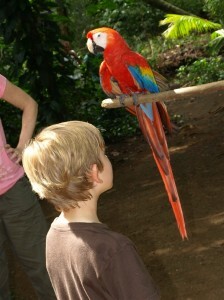 You think your kids are too young for a remote jungle adventure in Costa Rica? Think again! 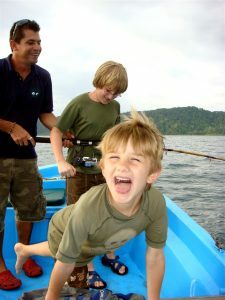 Our boys were 6 and 11 when we went “off the grid” and into the Costa Rica jungle. And Playa Nicuesa has just what it takes to transform a family trip into an adventure packed experience the whole family will be talking about for years to come. 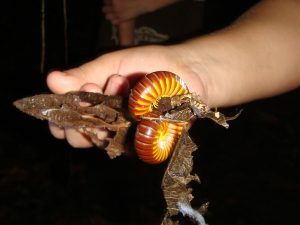 Be prepared to experience jungle mysteries and adventures without the crowds. If adventure is your family’s preferred travel style, then this place has it all! Our friends thought we were crazy, going “off the grid” with our boys. Do you think we were crazy? Perhaps we were. But just look at all the fun we had! 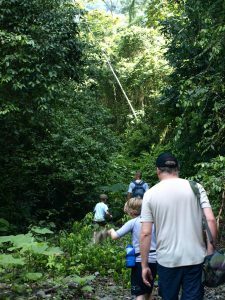 Check out these daily highlights to whet your appetite for your own unplugged family jungle adventure. Day 1 – Getting There is Half the Fun: As the saying goes, getting to Playa Nicuesa is half the fun! Why? Because it’s not so easy, but it sure is an adventure. For one thing, it’s only accessible by boat. No roads lead to Playa Nicuesa. 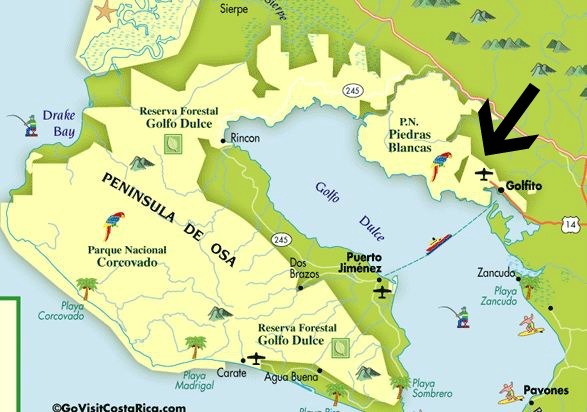 Most travelers fly into Golfito on a very small plane. We opted to use a shuttle service from the Manual Antonio area to drive us to the dock where we met our boat for the transfer to the Lodge. 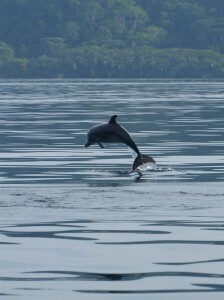 Once on board, we were treated to a beautiful boat ride up the Golfo Dulce to the Playa Nicuesa Rainforest Lodge. Time to be wowed! Upon arrival, our bags were unloaded and brought straight to our cabin while we leisurely walked up to the main lodge. What a site to behold! The main lodge was spectacular; our cabin equally so. This was what I call “jungle luxury.” I never said we were roughing it, did I? Though off the grid, Playa Nicuesa is powered by locally generated electricity. You aren’t completely left in the dark at night, though it is advisable to have a flashlight on hand! After settling into our 2-bedroom cabin, it was time to explore the grounds, and eat. Have kids, have hunger! My picky boys discovered a whole new attitude towards food here. From breakfast to dinner, and snacks in-between, the chefs amazed us with sumptuous meals created from the local environs. Our first meal was just the start of gastronomic bliss, after which it was back to our cabin for the evening. It’s amazing what you can hear when you turn off all those gadgets. We slumbered our first night away to the sounds of the jungle. But I digress. Let’s get on with the adventures! Day 2 – Our Jungle Adventures Begin: Awakened just after dawn to the sounds of howler monkeys, we were primed to take on our first full day at Playa Nicuesa. 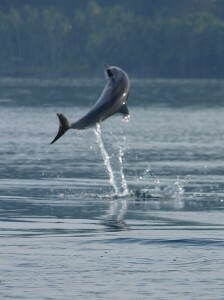 First on the agenda was a boat ride up the Golfo Dulce to the Osa Wildlife Sanctuary. A most incredible place not to be missed. 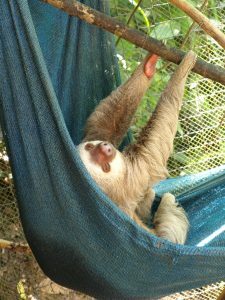 Their mission: wildlife rescue and rehabilitation of orphaned, injured and displaced animals of southern Costa Rica. We had a most spectacular tour of the grounds where we met resident spider monkeys, parrots and sloths, a coatimundi too. To say we enjoyed our visit doesn’t do justice to how amazing this place was. 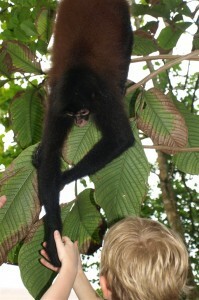 Yep, that’s our boy shaking hands with a resident monkey! Adventure complete. Time for our boatride back to the lodge, where we had kayaking, reading, and relaxation on the agenda. Oh, and food too! Did I mention how good the food was? Even for kids? Next up – Jungle Critters by Cover of Night: What kid isn’t fascinated with critters? 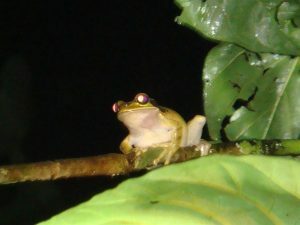 And what better way to find them than on a guided night critter hike? Our objective: to find as many critters as we could. Success achieved! Cockroaches, centipedes, crabs, and frogs, oh my! Snakes, spiders, lizards and birds too. They were all there. Could have done without those spiders, though! 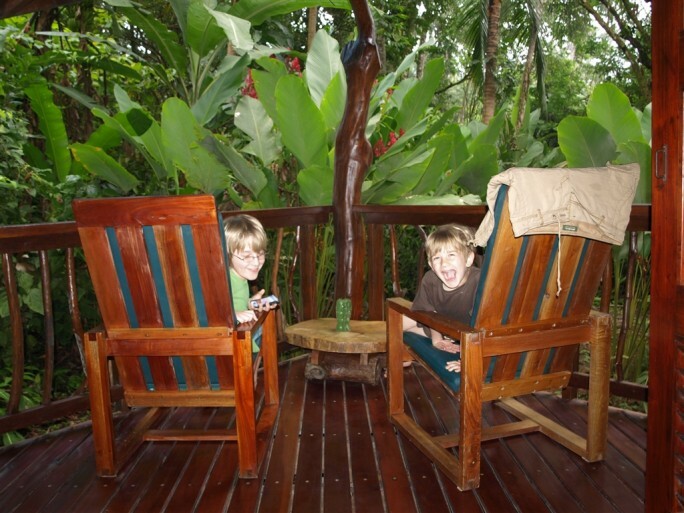 Day 3 – Wake up with a Jungle Hike: By now, the boys knew adventure was just around the corner. This time it was an early morning hike through the Piedras Blancas National Forest. Why early? To see the most critters, of course! From tucans to scarlet macaws to monkeys, even baby bats asleep in a tree, our guides found them! Not to mention just how much fun and informative our guides made a “simple” walk in the jungle. Like, how aggressive toucans can be! “Duck and cover” became our youngest’s mantra whenever he heard the word, “toucan in a tree.” At the end of our hike, we were treated with a refreshing swim at the base of a waterfall. And once again, our guides made even a “simple” swim into a fun time. Our hike complete, it was time to sit back and enjoy all that Playa Nicuesa offered. For one of us, it was a book and a hammock. The more energetic went kayaking along the shoreline and fishing off the boat dock. As for me … it was time for a relaxing massage under the jungle canopy, listening to the chatter of scarlet macaws high above in the trees. Sorry, no photos of that! Day 4 – A’paddling We Will Go: OK, now we were totally spoiled by our adventures and our guides who totally rocked. Suffice it to say, we expected a lot from our morning kayak adventure. Did it deliver? A resounding yes! Our oldest was ecstatic that he got to paddle his own kayak. Our youngest loved the “ride-along with Dad” feature, splashing his hand in the water and searching for critters. Did we see any? Not at first, but with the expert knowledge of our guide, he soon found anacondas wrapped up in trees, birds hanging in branches, tiny crabs skittering along the shore. We wouldn’t have seen them without our guide! Our youngest was thrilled when his kayak “sat” just underneath a sleeping anaconda. Key word – sleeping! I kept my distance none-the-less. After a fun, but tiring, kayak down-river to the Golfo Dulce, it was back to Playa Nicuesa for lunch and a restful afternoon. Sleep for some of us! But our adventures were not yet over for the day. Just when we thought our day couldn’t get better, it did. 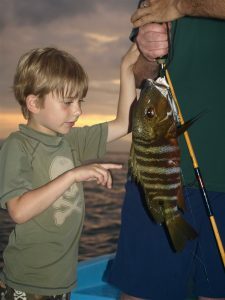 Fishing For Fun: Though two of us were a bit skeptical, we all agreed on a late afternoon Golfo Dulce fishing trip. Once again, it was all about the guides. They knew exactly where to find the fish. And boy did we land fish! Three “dinner ready” tuna and two “equally-dinner-ready” red snappers. 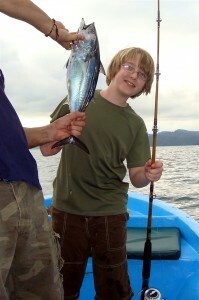 Even us nay-sayers had to admit, this fishing adventure was awesome! Better yet – the fabulous chefs back at the lodge cooked our fresh catch and served it for dinner. And the boys ate fish! Red snapper and tuna, both! They even asked for more. It was certain to say … this trip was transforming our boys. 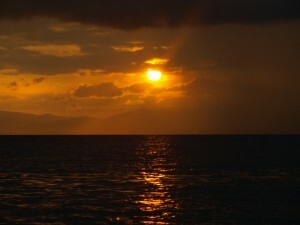 Day 5 – Our Last, But Not Least, Day: What a way to end our time at Playa Nicuesa. We decided to cram in an early morning boat tour of the Golfo Dulce, and wow, were we in for a treat. Within minutes of leaving the dock, we found ourselves in the midst of a pod of 100+ dolphins. Well, nobody counted but it seemed like that many! And boy, did they put on a show. 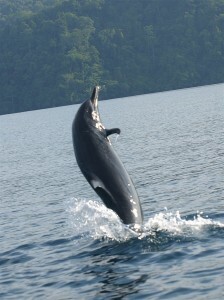 For nearly an hour, we had front row seats to the most amazing, impromptu, acrobatic wild dolphin show. Dolphins surrounded us, so close one could practically touch them. We were completely enthralled. Words can’t describe what we saw this morning. Other than it was probably THE highlight of an already awesome five days in the jungle. Sadly, the time had begun to set on our Costa Rica jungle adventure. It was back to Playa Nicuesa for our final good-byes, then off to catch our flight back to civilization. Would we do it all over again? Absolutely! 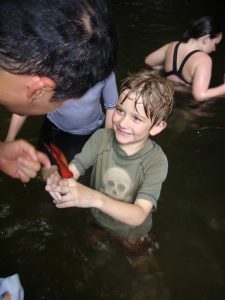 It’s been two years since our Golfo Dulce, Costa Rica adventures, and the boys keep asking to go back. What would they want to do again? Their response … everything! Except perhaps the snorkeling. Not everything was perfect, and snorkeling here just didn’t pan out for us. Final thought: for some, Playa Nicuesa, Costa Rica might be too wild. Others might find it not wild enough. For our family, it was just right! Featured Writer: Carol of Lets Get Deals Today. Great article, Carol! I felt as if I were there with you. Costa Rica is now on my Bucket List now. Great description and pictures.